Win a Limited Edition Kydd Collection Print! 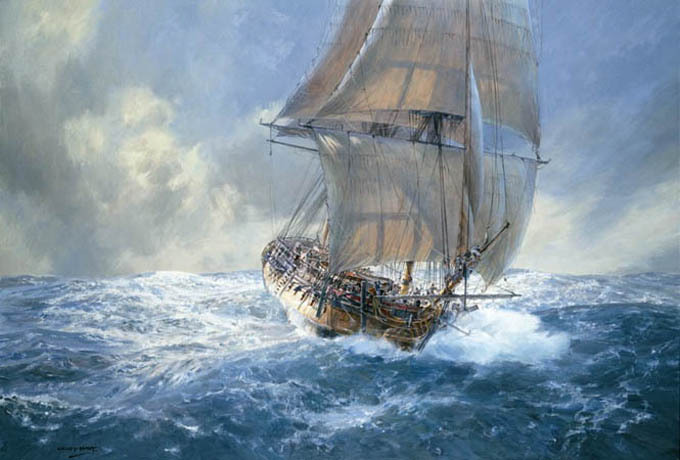 You could win a limited edition print of HMS Artemis! This wonderful print is from the original oil painting commissioned for the cover of Artemis, the second title in the Kydd series. Those who have sailed the Great Southern Ocean have confirmed what an astonishingly accurate representation this is of those seas and it is also a particularly fine depiction of an eighteenth-century frigate at sea. The movement of the ship that Geoff portrays is exceptionally dynamic. He certainly captured the flying qualities of the crack frigate HMS Artemis – and is probably my favourite of all the covers he painted. How many of Geoff Hunt’s paintings reproduced as prints for the Kydd Collection include ships boats in the water? Contest closes end September. The winner will be the first correct entry drawn on September 30 and will be notified by email. Additionally, Art Marine is offering a 10% discount on all Geoff Hunt prints for the month of September. Just enter the code JSTOCKWIN at the checkout. ← CONQUEST: the Race to Empire Begins!